If you’re looking for a solid method to win at blackjack and are prepared to put in the hours then card counting may interest you. Card counting is not suitable when playing solo games at online casinos where random number generators are used, only consider it a bricks and mortar casino. In fact card counting is only recommended for those who can memorise sequences of cards and basic strategy while still looking like a novice player. The idea behind card counting is that you are trying to wait until there’s a higher likelihood of a ten/ace being dealt before betting larger sums. If you get it right you can nudge the odds slightly in your favour which will prove profitable over a long period of time. Edward O Thorp enjoying himself. 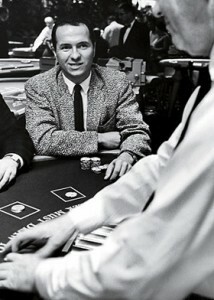 The generally accepted publiciser of card counting is Edward O. Thorp, author of the 1962 bestseller, Beat the Dealer but there were certainly professional counters around before him including Joe Bernstein and Harold Smith. Over subsequent decades, increased computing power enabled the introduction of more complex counting systems but the basic idea remains the same. Ken Uston wrote about a ‘Big Player Team’ tactic in the 1970s which relied on players at a number of tables counting cards and then surreptitiously calling over a colleague who would then join the table and make big bets. This player would therefore avoid any negative runs of cards and could be advised to leave when the counter decided the time was right. The value is the EOR (Effect Of Removal) and this can be described as the influence it’s removal has on the remaining cards. If we see lots of numbers in the 2 – 6 group pass through the game then this means there’s a higher chance of being dealt a 10 card in upcoming hands. This is the time to increase your bets. Similarly, lots of ‘value -1’ numbers is a sign that you should decrease your bets. Card counting is not generally illegal because of course it’s just maths trick (unless you use some sort of computerised device which definitely is illegal); however casinos don’t like it for obvious reasons. A venue which suspects you are counting cards may invite you to go elsewhere.